Denmark is one of the Scandinavian countries. It joined the European Union in 1973, but isn’t part of the European Economic and Monetary Union, so it still has its own currency, the Danish krone. Denmark highly depends on foreign trade and is also a strong supporter of trade liberalization. The country enjoys a high standard of living. Every year there are several ecommerce events being organized in Denmark. We have a handy ecommerce events calendar, where you can find all the major online retail events in Europe. But you can also check out only the ecommerce events in Denmark. Estimates of the World Factbook show there are about 5.4 million Internet users in Denmark. This corresponds to a stunning 96.1 percent of the total population. Data from Eurostat in 2013 showed that in Denmark, 79 percent of all internet users shopped online the year before. Four out of five adult Danes shopped online during the last six months. 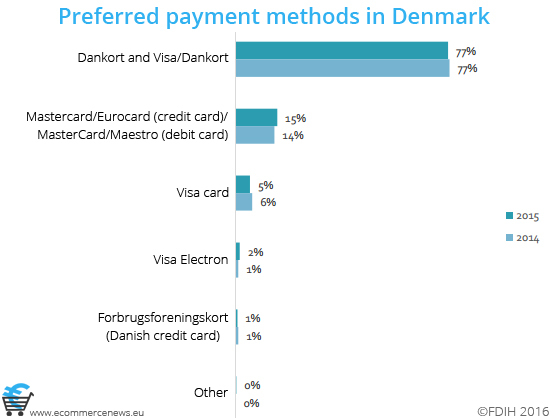 The average annual spending per online shopper in Denmark is 2.252 euros. And eMarketer’s Worldwide Mobile forecast report showed that Denmark has the highest smartphone penetration rate in the world: 77 percent. Based on data from Dankort, ecommerce in Denmark was worth 13.84 billion euros in 2016. It accounts for about 10 percent of the total retail turnover. Clothes, Shoes & Jewelry is still the most frequently purchased product category in Denmark, followed by Music, Books, Games & Toys and Tours & Cultural experiences. In 2015, the product category Home, Garden & Flowers showed a strong increase in popularity, while IT, Telecom & Photo and Music, Books, Games & Toys both showed a downward trend. Some of the most popular and biggest online stores in Denmark are online book store Saxo and consumer electronics retailer Elgiganten. Other popular online retailers in Denmark are Amazon, Zalando and Cdon. March 21, 2019PostNord has started a pilot project to test a completely new infrastructure for the delivery of parcels. Together with the company Swipbox it started an experiment in Kolding in Denmark to deliver parcels to digital parcel boxes that are in close proximity to consumers’ homes. March 7, 2019The ecommerce industry in the Nordic countries was worth 230.2 billion Swedish kronor, or 21.87 billion euros, in 2018. The biggest share of this online turnover comes from Sweden, which also has the highest proportion of people shopping online. March 6, 2019Fashion retailer Zalando will expand its relatively new beauty category in Europe. Over the next two months, the German ecommerce company will start selling its beauty products in Sweden, Denmark, France, Belgium and Italy. February 11, 2019Nets, a payment service provider from the Nordics, has announced its strategic alliance with Przelewy24. This is a major online payment service provider from Poland. This news comes after Nets recently acquired Dotpay/eCard. January 21, 2019DHL Express will build a new logistics hub in Denmark, that will arise at Copenhagen Airport. If the hub becomes operational, which is planned to happen in 2023, the logistics services provider will be able to handle nearly 37,000 packages per hour, 24 hours a day. Read all our articles about ecommerce in Denmark.